There’s a room off our kitchen dedicated as a playroom for our daughters (ages 2 and 4). Originally, the house plan designated this space to be an office or bedroom. Since it’s on the first floor, I’d love to utilize it as a spare bedroom for my folks when they visit. Rather than moving my kids (and their stuff) to another level of the house, which would be less convenient and surely imprudent (note ages! ), I’m considering installing the space-saving standard of my NYC roots—a Murphy Bed. Murphy beds have long been a solution for apartments and small spaces. But they also work beautifully in larger homes to make a room or space multi-functional. The Murphy Bed was invented by William L. Murphy as a way to hide the bed in his one-room apartment, so that he could have enough space to entertain. He created the Murphy Wall Bed Company in 1900 after applying for his first patent, and the rest is history. An incredible array of options and styles exists in modern Murphy Beds. If you’re shopping for one, you should consider several things. 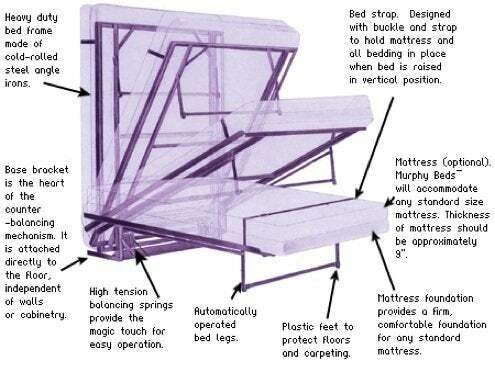 – Spring Mechanisms are used in the traditional Murphy Bed system and usually consist of a heavy-duty compressed steel spring housed within the bed frame. They are counter-balanced, which makes lifting and lowering the bed easy. But they do need adjustment after years of use, since the springs can fatigue and stretch over time. – Piston Mechanisms utilize gas or air pressure to support the raising and lowering of the bed frame. Unlike a spring mechanism, a piston mechanism can lock when the bed is not in use—a valuable safety feature. Piston mechanisms cannot be adjusted once installed but compared to spring mechanisms, they experience much less fatigue and sagging. – Floor Mounting is required by many systems with spring mechanisms. Mounting a Murphy Bed into the floor makes it extremely stable but may permanently damage the floor. A floor-mounted Murphy Bed is also very difficult, if not impossible, to move once installed. – Wall Mounting is most commonly used with piston mechanisms. 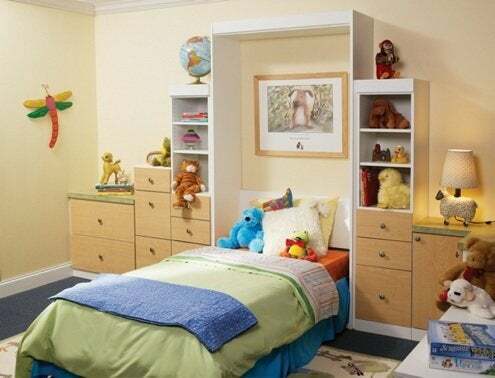 Generally, a wall-mounted Murphy Bed is attached to studs and can be moved with minimal damage.